I can’t hate Donald Trump. I do hate the Republicans who’ve enabled him. I do hate the Republicans who’ve enabled his remarkable popularity. 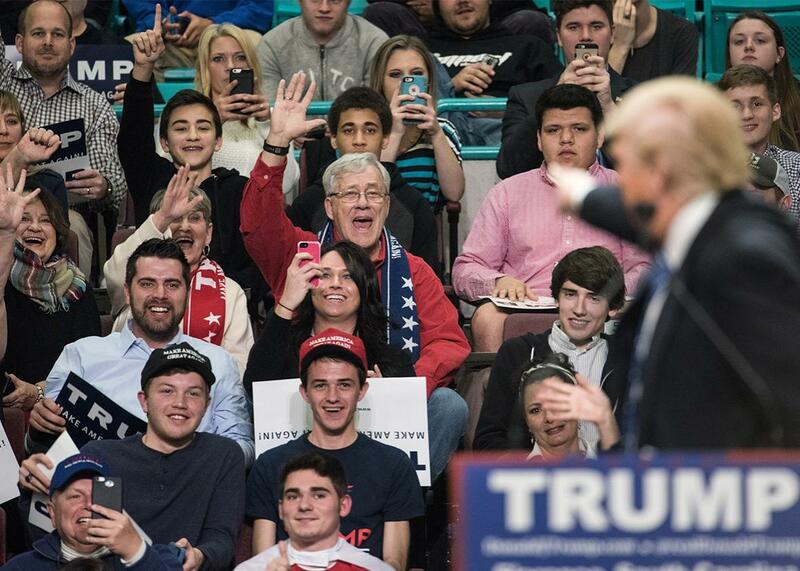 Donald Trump acknowledges supporters at a campaign rally last week in South Carolina. I can’t bring myself to hate Donald Trump. Part of this is a quirk of biography. Like a lot of native New Yorkers around my age, I find his outer-borough accent so comfortingly familiar that I can’t help but smile whenever I hear his voice, even when he’s saying something outrageously offensive. To a certain kind of smart, scrappy, lower-middle-class New York youth in the ’80s and ’90s, Trump was the living embodiment of gaudy success—a kind of mash-up of Santa Claus, Scrooge McDuck, and Vito Corleone. When I was a kid, it was not at all uncommon to hear friends and classmates declare that they wanted to be Donald Trump when they grew up. They didn’t want to be real estate developers or casino magnates. They literally wanted to be Trump, which seems doubly strange in hindsight, as so few of the kids I have in mind were white. But nostalgia isn’t the only reason I can’t hate Trump. The deeper explanation for my ambivalence is that he is speaking for millions of Americans who’ve lost faith in the political process. Trump’s victory in the New Hampshire GOP primary was broad and decisive. He fared well among Republican primary voters across the ideological, religious, and class spectrum. As Ron Brownstein has observed, however, “[Trump’s] appeal notably lagged among both evangelicals and better-educated Republicans.” Elsewhere, in an analysis of the Iowa counties in which the various Republican counties fared best, Patrick Ruffini found a striking contrast between the counties that went for Rubio and for Trump. While the counties that went for Rubio tended to have a higher number of households with incomes greater than $200,000, more new home construction, and more adults with post-graduate degrees, the counties that went for Trump tended to have higher rates of unemployment and a higher share of adults who identify as Scots-Irish, or simply as “American.” This fits neatly with Nate Cohn’s analysis of the Trump coalition, which he finds is concentrated in counties across the country with a low proportion of college-educated adults. Trump is strongest not in the metropolitan corners of America, where he’s spent most of his life. Rather, his strongholds are the mostly overlooked sections of the South, Appalachia, and the rural and semi-rural North. Why is Trump doing so much better among non-college-educated, secular voters than among churchgoers and the college-educated? One possibility is that the Republicans who look to Rubio, Bush, and other mainstream candidates are broadly satisfied with the direction of American life. They’re more likely to believe that their lives have been enriched by immigrant labor, and to feel more insulated from global economic competition. The religiously devout can be found in every social class, but those who are part of strong religious communities have a source of spiritual and emotional support that their secular counterparts often lack. None of this is to suggest that Donald Trump deserves the support of those who are putting so much faith in him. It’s fair to question his judgment, his temperament, and his understanding of what an executive can and can’t do in a constitutional republic. I certainly do. But there is a reason Trump’s message is resonating with working-class white voters while the messages of other Republican candidates are not. His supporters believe that Trump will fight for them, and they have no such confidence in his GOP rivals. The voters flocking to Trump believe that they’ve been lied to and betrayed by conventional politicians, and that he is offering them the unvarnished truth. When Barack Obama first emerged on the political scene, he excited voters who saw in him a reflection of their own experiences. His mixed ancestry, his upbringing as the son of an intellectually curious and at times very poor single mother, and his experience of upward mobility through higher education—all of these experiences resonated with Americans who’d had similar journeys, and who felt validated by Obama’s narrative. Trump and Obama are almost as different as one American can be from another. Nevertheless, Trump has built a gut-level connection that is no less formidable, and with an entirely different set of Americans. Obama famously swore off the conventional route to wealth and achievement, having chosen to work as a community organizer rather than climb the professional ranks. Trump would never have renounced earthly rewards in the same way. What Trump did was reject the upper-class culture of restraint. Whereas those who inherit great wealth typically shrink from proclaiming the bottomlessness of their appetites, Trump openly describes himself as “a very greedy person.” That’s something Mitt Romney, another product of privilege, would never say in a million years. Trump’s avariciousness reads as authenticity, and so he’s somehow more believable when he declares himself a convert to public-spiritedness, as when he insists that he wants to harness his greed for good—that he wants “to be so greedy for our country,” as he said at a presidential debate in January. Trump is a traitor to his class, who rails against hedge funders and the executives of drug companies for manipulating the political process to enrich themselves at the expense of ordinary Americans. These are the very same people you’d expect Trump to dine with at Mar-a-Lago, and here he is declaring war on them. The fact that his tax plan would “be a huge windfall for private equity and hedge funds,” in the words of Len Burman, director of the Tax Policy Center, is almost immaterial to the people who support him. There is something strange and compelling about seeing a billionaire declare war on his own kind. Contrast Trump with the runner-up in the New Hampshire primary, John Kasich. Kasich has at least as much of a claim to speaking for the Scots-Irish whites who have been central to Trump’s success. Though he’s of eastern European descent, Kasich grew up in working-class western Pennsylvania, where he lived among the descendants of Appalachians who fled rural poverty for jobs in the region’s booming industrial cities. Yet Kasich seems incapable of playing the role of class traitor. Before becoming governor of Ohio, Kasich had parlayed his political renown into a job as a managing director at Lehman Brothers, a storied bank that went down in flames when the 2008 financial crisis hit. Kasich is an admirable figure in many respects, and he’s forgotten more about the workings of government than Donald Trump will ever know. Yet in the eyes of many Trump supporters, Kasich is the more compromised figure, as Trump has been quick to own up to his gleeful participation in political corruption. Imagine how dangerous Trump would be if he were more disciplined and focused, and if he had serious prescriptions for how to make the global economy work for Americans in the bottom two-thirds of the income distribution. For now, however, Trump is on a mission of destruction: He is demonstrating the weakness of the Republican donor class, which has barely dented him over months of campaigning, and he is forcing orthodox conservatives to question the agenda they’ve been advancing for decades as they see rank-and-file GOP voters reject it in large numbers. I hate Trump far less than I hate the Republicans who’ve paved his way. And if Trump goes down in flames, as I still believe he will, the Republican Party must never forget the Rust Belt Americans he’s inspired—because if they do, there will be another Trump waiting in the wings.